Atlas vs The Indian Food Curry Challenge at Prince of Punjab Pub and Grill in Leicester, England (Day #19/ Challenge #20). Randy Santel says “Hey everybody!! It’s day #19 of our 18-Country 2018 Summer Tour and for this food challenge I’m at Prince of Punjab Pub and Grill in Leicester, England of the United Kingdom. 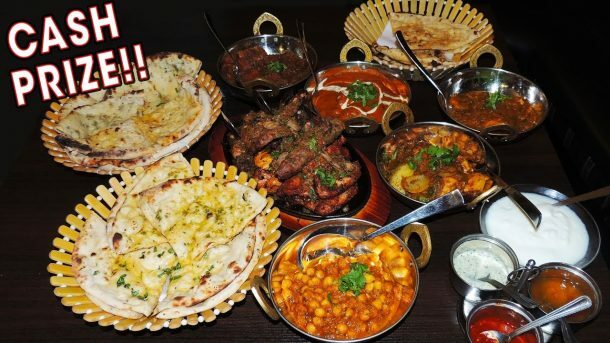 I’ll be taking on their undefeated Indian Food Curry and Mixed Grill Challenge which consists of 5 delicious curries plus 5 big naan breads and a 1kg mixed grill!! I got to choose which curries and naans I wanted and they were all delicious!! Thanks to Harpreet and his family for their wonderful hospitality, and thanks to everyone who came that night to watch and meet us!! We appreciate our friends in Leicester and all around England and the UK! !